The Best Shark Dive in the World! : Gene Ward - call back the Hound Dogs! Thanks Mike. Your efforts to pull back from a fight were in good faith and I think you showed a lot of restraint. The issue is now legislative. 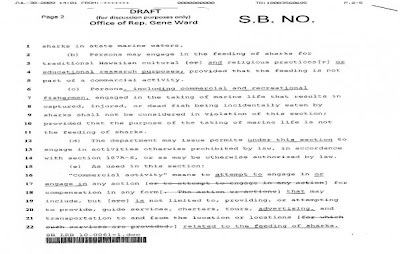 I think that Rep Ward himself sees the vision here - his underlings perhaps not so much and we should keep pressure on them to stop pushing "the shark fear" in Hawaii. It's a complete disservice to the islands sharks, demonizing them, and to Hawaii's 40,000 shark tourists. What amazes me are the names and businesses that are listed as supporters on the Safe Waters Hawaii site. Have they read that site and do they understand how the presentation of all sharks as bloodthirsty killers hurts these animals? So you've caught on to the same phenomenon huh. I can see (!) the Pelagic Foundation but - the Humane Society??? WTF??? Who's next - PETA and the Sea Kittens? Yes Ward seems OK but it's equally apparent that he has been conned into being the political front man of a coalition of Shark haters and Fish killers. Let's just hope that the man keeps his wits. The "feeding" issue has been put to rest as everybody has agreed on the way forward. Now, it's about one thing and one thing only: preserving jobs and millions in tourism income in a time of recession. Hoolllyyyy f*#k O_o Let it be known that had that been me who the shark was charging, I would not be laughing, but screaming through the water while simultaniously dying in my snorkel. Twice. I guess if you're so used to being in the water, a shark encounter that (I use the term lightly) 'annoying' wouldn't be much different as going out for an afternoon jog only to have some dog chase after you, to which you'd err casually kick it aside. No, we never take Sharks lightly and know all too well how dangerous they can be. But so can be your dog! Actually, the comparison between dogs and specifically, Grey Reefs is quite accurate! The trick is not to create dangerous situations and to understand the language of the animal - and yes, Sharks do signal their mood very much like dogs do! What is important to know is that predatory Sharks do not hunt us. That Grey Reef got stimulated by the erratic movements of the struggling fish, and by the fish blood. And then, it "went nuts", which in Shark lingo is called frenzy - but still, all it wanted was the fish and not the humans! They should have avoided the situation by not shooting when the Shark turned up. 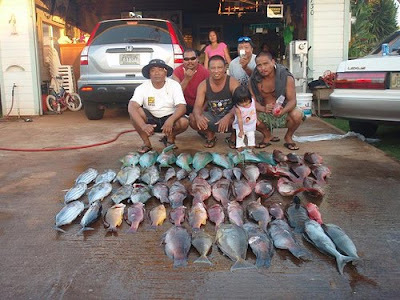 And when the situation unfolded, they should have given up all the fish straight away and retreated to the boat - which, being very experienced, is essentially what they did. Maybe you should consider giving us a visit and learning to dive!